On Jan. 26, Credit One Bank, issuer of the Official Credit Card of the Vegas Golden Knights, and the Vegas Golden Knights Foundation presented HELP of Southern Nevada with a $14,550 check at the Shannon West Homeless Youth Center. $7,275 was raised from a silent auction at the Vegas Golden Knights game on Dec. 6, 2018 and Credit One Bank matched that amount. Residents of Shannon West Homeless Youth Center gathered for an NHL All-Star Game viewing party that included dinner, raffle prizes and the official check presentation. 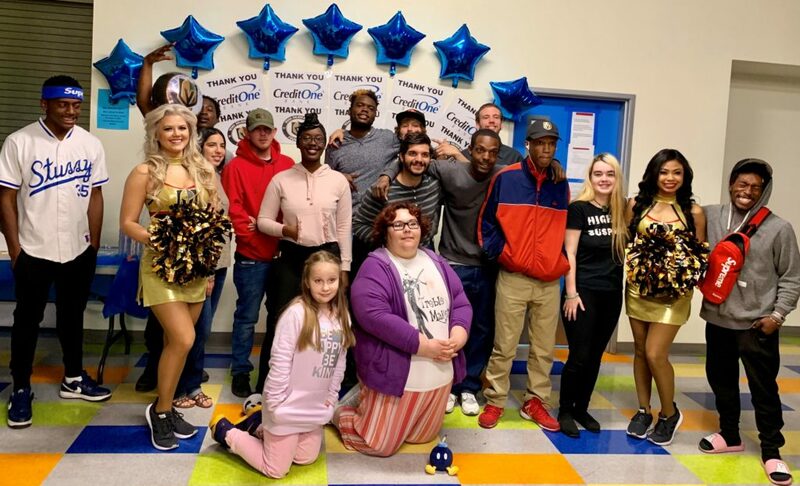 In attendance were center staff, representatives from Credit One Bank, HELP of Southern Nevada board members and a special appearance by members of the Golden Aces, the Vegas Golden Knights Promotional Team. Through their namesake foundation, the Vegas Golden Knights support Las Vegas non-profits that make a difference every day via direct grants and fundraising partnerships. These initiatives are funded through corporate sponsorships, ticket sales, signature events, in-game programs, and merchandise sales. As Las Vegas’ first major professional sports team, the Vegas Golden Knights recognize and embrace their duty to strengthen and inspire our community.